To our eyes Makanyi is THE most attractive and stylish lodge in the Timbavati but without going over the top – the use of natural elements like stone walls, wood and leather adds warmth to the unmistakably contemporary lines to create a luxurious yet welcoming lodge. In a word – stunning! In the hotter summer months, why not upgrade yourself to one of the Luxury Pool Suites as they boast gorgeous private plunge pools! We love the stylish bathrooms with their stone feature walls, standalone bath and huge indoor and outdoor showers – not to mention the indulgent Africology amenities! wide, large windows and sliding doors open up the room beautifully to the bush outside – you can literally lie back on your bed whilst looking out for wildlife on the savannah in front of your room. The story of Makanyi is of a young London based mother who, on a chance visit to South Africa, went on safari and underwent a life changing experience that prompted her to decide to leave the big smoke and re-locate with her young son to grow up in the African sun. Looking for a suitable lodge site she came across Makanyi and fell in love all over again and bought it virtually on sight. It’s not hard to see why either – since it opened its door back in mid-2015, Makanyi has rocketed to the top of the charts in terms of lodges in the Timbavati reserve. 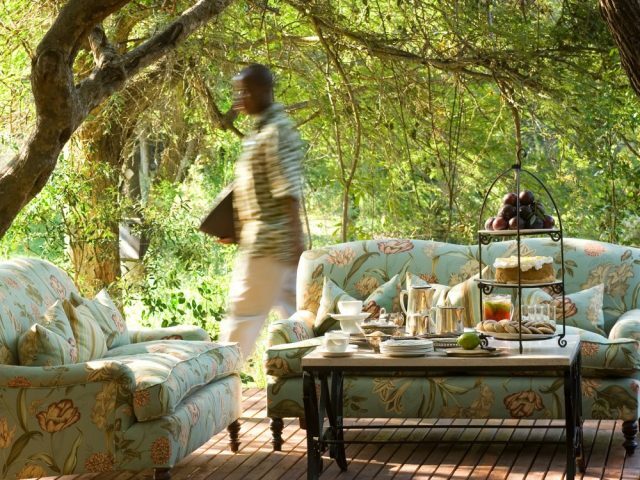 Quite simply, this intimate new lodge is to our minds THE most stylish of all the lodges in the Timbavati! Located alongside a large dam which attracts a wealth of animals to satisfy their thirst, Makanyi’s 7 luxurious suites are some of the most attractive in the business, utilising light and space to great effect to create spaces that feel warm yet airy. They are divided into 2 different types – 5 Luxury Suites and 2 Luxury Pool Suites – which have the same overall look and feel. Whilst the style is unmistakeably contemporary, the use of natural stone in the feature walls and light, smooth screeded cement flooring bring a natural organic feel along with the traditional thatch ceilings sitting high above your head which add to the feeling of ample space. 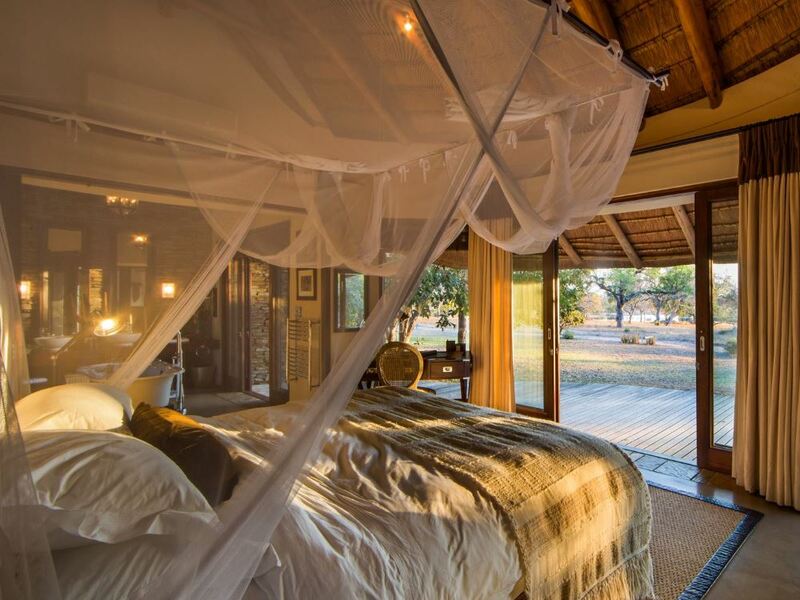 Off-white and earthy tones add elegance and class whilst the wide, large windows and sliding doors open up the room beautifully to the bush outside – you can literally lie back on your bed whilst looking out for wildlife on the savannah in front of your room. Leading off on one side of the massive bed draped romantically with mosquito nets, is the lovely stone-clad bathroom complete with twin vanities, standalone bath and massive glass enclosed shower (there is another outdoor shower too!) 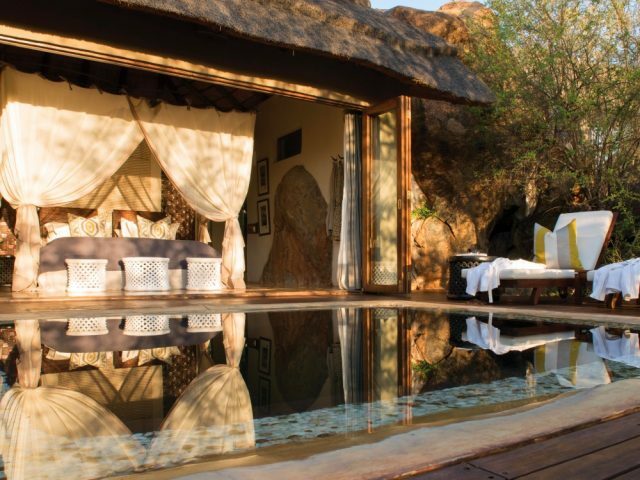 One of the things you’ll really appreciate are the use of high-end luxury Africology amenities! On the other side of the bed is a cosy lounge area complete with its own fireplace, the perfect spot to cuddle up in on a chilly winter’s evening! The remaining two suites of the seven have been designated as “Luxury Pool Suites” – and these are certainly our top choice for romantics and honeymooners! Slightly more removed from the main lodge and hence more private, these also boast the addition of 4 poster beds as well as gorgeous private plunge pools sitting at the edge of the private decks - the picture-perfect spot for champagne with your partner as the sun sets on another beautiful day in the Timbavati! Dubbed locally as “The Place Where Something Sacred Came Down To Earth”, the Timbavati reserve is an incredible location for those itching to see the Big Five in their natural environment. Better still, Timbavati prides itself on being home to a particular unique and spectacular attraction: the breath-taking White Lions – perhaps you will even be lucky enough to spot these famous animals! But even if that dream sighting doesn’t materialise, the chances are that you won’t return home disappointed as the Timbavati is renowned for the quality of the Big Five sightings on offer. Sharing an unfenced border with the Kruger, animals are free to wonder through the 2.4 million hectares of this wild and untamed landscape. 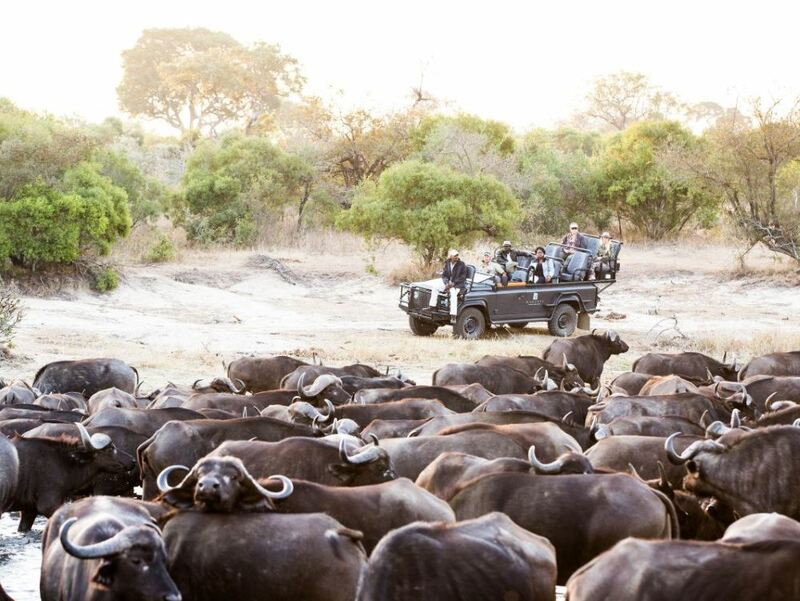 Obviously the animals can make themselves scarce on occasion, but the Timbavati at its best can deliver awe-inspiring sightings of large breeding herds of elephant and massive herds of buffalo over 1000 strong with the inevitable predators following in ruthless pursuit. As you would expect from a top lodge, the rangers and trackers of Makanyi have an incredibly in-depth knowledge of the flora and fauna of the Timbavati (and, it would seem, a sixth sense that tells them where to find even the most elusive leopard!) But there are some interesting twists that Makanyi also has up their sleeve to offer you: specialised safaris that focus on art and photography (under the tutelage and guidance of artist Warren Cary and esteemed wildlife photographer Hilton Kotze respectively) Otherwise you can while the afternoons fishing for tilapia in the dam or gazing up at the stars through a powerful Celestron telescope. After your morning drive, the lodge itself is the perfect place to relax and completely rid yourself of any remaining city stresses. During the heat of summer, you’ll no doubt be drawn to the attractive rim flow pool that stretches sinuously along the front of the main deck. The friendly staff will always be happy to conjure up a long and refreshing drink whilst you lounge about watching the animals coming down to the dam in front of the lodge. If that’s even too much work, then head off to the Spa for an indulgent massage. On the other hand, if you’re worried about the effects of all the delicious food on your waistline, then there’s always the option of heading off to the fully-equipped gym to work up a pre-dinner appetite. You’ll always be able to find some little nook where can settle down and relax with a good book and soak up the tranquillity. The spacious deck is a favourite of course, but the lounge in the main lodge is also a stylish and welcoming space, beautifully decorated and with a host of comfy chairs where you can curl up in front of a roaring fire if the weather turns chilly after dinner. Third adult will pay 50% of the per person sharing rate when sharing a room. On request only. 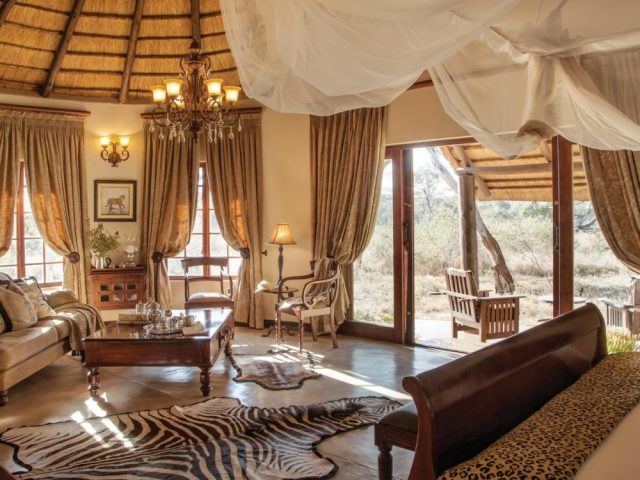 Stunning rooms and great service are the stand-out features of this upmarket lodge overlooking a busy waterhole in the Timbavati.